The question that comes up time after time, concerns which piece of equipment to buy first, and there seems to be a lot of confused thinking about this. The usual solution is the fins. My answer is invariably the same – the suit. When I was told this, it took me a very long time to accept it. At first appearance there seem to be two possible answers, one for freedivers and one for spear fishermen. But although the answer is very clear for freedivers, actually they eventually come to the same point. My biggest lesson came teaching potentially elite freedivers in Mexico. One thing has to be clear, if you want to make a living teaching elite freedivers you better have another job as well!! Elite freedivers, with few exceptions, have a burning passion and no money. being slender and fit looked like a stick of spaghetti in a bean bag. After only half an hour in the water and two dives each, they were an interesting shade of blue and shaking like leaves in a high wind. The next idea was doing all the warm ups dry, sitting in the boat. That helped a bit, but did not really solve the problem. In the longer sessions doing negative and FRC dives or doing drills, repeats to 30mts counting movements, it became clear that this was mission impossible. It was not possible to do sufficient dives to make any progress. Also if freediving is all about relaxation, try relaxing when you are shaking with cold! it is the most athletic and challenging, it is the choice of the minimalist. All you need is a suit a neck weight and a nose clip. Makes travelling easy. Try travelling with a monofin! Free immersion has a history that goes back before recorded history, eventually after our ancestors solved equalisation issues it developed into Variable weights in a quest for ever deeper depths. In the pool we could do Dynamic No Fins and Static. Progress was electrifying the moment this was solved, one after another the Mexican records fell and I realised I was looking at world class potential. Also training was fun no longer something you had to force yourself into cold water to do. In the last international competition in Greece, one of Israel’s best divers and our record holder in CNF was lent a specialist CNF suit by a British Athlete that happened to have the same size, and he improved his personal best by a staggering 10mts and new Israeli record. Now as for the fisherman we forget that the suit is also, apart from warmth and comfort, an essential safety device. Fishing without a suit in summer with a weight belt is a recipe for disaster. If you come to the surface and blackout you sink! think about it. How often have I found fishermen on the shore so cold they could’nt talk. The fish are there today, and so it goes on and on till it does’nt go on any more. With a suit South African spearos have learnt that on a stressed dive open the flap of the weight belt and hold it during the ascent, then if you blackout the belt will release and you will reach the surface without the risk of sinking again. If you have been smart enough to figger out that doing a course might not only save your life but be the shortest and safest way to realising what you are really capable of, then when to get the suit becomes the question. The suits that come with the course are usually 5mm one piece suits, these are barely adequate in summer and only if they fit really well. Really well means skin tight everywhere. 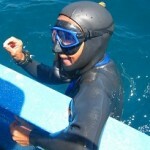 Apart from not being nearly as warm as a freediving 2 piece suit with a hood they are not nearly as flexible. So you waste more energy just moving the suit. So if you can afford it buy your suit before the course and save the risk of managing half an hour in the water then enduring 1 1/2 hours shivering. A course is all about learning skills and a lot of repitition is needed. The next blog will be on choosing what kind of wet suit is for you. This exercise is called Uddiyana Bandha and has been used as a abdominal tonification and purging exercise in yoga for hundreds of years. Recently in the world of freediving the effects of diaphragmatic manipulation in this way has been proven to improve the elimination of air from the lungs and thus enables the ribcage to flex and compress more with the more extreme pressures at depth when the lungs have been reduced to Residual volume. Simultaneously with the reduced volume and the increased flexibility the trained freediver is able to “pull up” a little more air from the airways for deep equalisation. This exercise must be practised carefully on an empty stomach, and regularly to reap the benefits. However a word of caution, just with this practice alone it DOES NOT mean that a freediver who has a good equalisation technique should jump irreverently to depths without a well prepared training program. The body needs time for physiological adaptation and the rush for depth must not be at the expense of safety. Injuries that can result in irreversible damage are pulmonary barotrauma, i.e lung squeeze and trachea squeeze, that can leave scarring and result in limiting your depth freedives permanently. ALL UNNECESSARY AND COMPLETELY AVOIDABLE. After all, Freediving is about fulfilment, exhileration, human potential and absolutely about humility!